As they entered the 14th day of their attempt on the Jules Verne Trophy record Yann Guichard and his team enjoyed good sailing conditions allowing them to keep the advantage on ‘IDEC’ of 361 nm. The first of the three symbolic Capes of this round the world sailing race, the Cape of Good Hope, was reached after just 12 days 13 hours 8 minutes: one of the best ever times of the Trophée Jules Verne, which first started in 1993. But it was several miles away to the South East, at Cape Agulhas, where the time reference comes into its own as this point of Africa marks the entrance into the Indian Ocean. However, in order to reach it, Spindrift 2 had to navigate around the Saint Helena anticyclone, go through an oceanic ridge and finally, take a left before heading towards Cape Agulhas. Despite this detour, which forced the black and gold trimaran to dive South up to 43°, Yann Guichard and his 11 crew members keep a lead on the reference time of IDEC Sport, the current record holder. 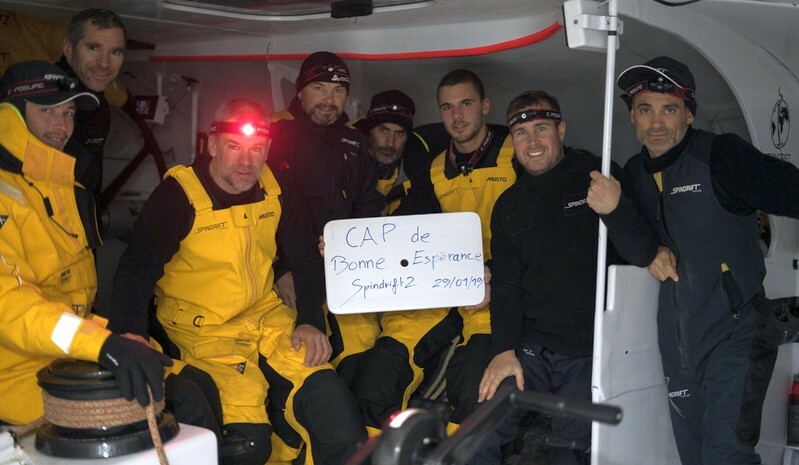 As a result, Spindrift 2 took 12 days, 14 hours, 58 minutes from Ushant to reach Cape Angulhas, and from the equator, 7 days 17 hours to go beyond this point in Africa. We’ll leave the Kerguelen to the North as we’ll undoubtedly go down to 53-54° south. However, we’ll also have icebergs ahead of us from Wednesday . . .
At an average speed of over 35 knots for 3 days, the black and gold trimaran will be able to hold this steady pace through a relatively manageable ocean heading to south of the Kerguelen! If this southerly course enables the team to shorten their route while benefiting from a sustained current, going down to 53° South would present them with the problem of drifting ice and where a number of icebergs have been clearly located by the CLS satellites. On this stretch of the route, Spindirft 2 needs to be very fast because Francis Joyon and his crew made the Indian Ocean crossing extremely quickly as they still hold the WSSRC record (5d 21h 8m)! Having said that, the capabilities of the black and gold trimaran in the breeze give hope that it will retain the lead on IDEC Sport’s timing to South of Tasmania, the hot spot between the Indian Ocean and the Pacific.